Board certified Seattle plastic surgeon Dr. Shahram Salemy has received multiple awards over the course of his distinguished career. With offices in both Seattle and Richmond, WA, he is highly rated as one of the best providers of plastic surgery of the face, breast, and body. Here are just some of the awards that Dr. Salemy has been honored with. 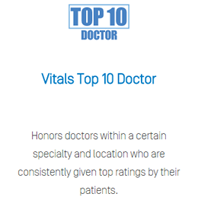 Bestowed by the American Institute of Plastic Surgeons (AIOPS), the Washintgon’s 10 Best Doctors designation is based on nominations from patients, fellow physicians or AIOPS itself. AIOPS recognizes plastic surgeons who attain the highest levels of achievement in their field. Dr. Shahram Salemy is proud to have earned a place on the Healthgrades Honor Roll, which recognizes top physicians in the Unites States who meet stringent requirements and criteria, including board certification in their specialty. Healthgrades emphasizes the critical importance of proper education, training and experience in ensuring patient safety. RealSelf.com awards the Top Contributor status to less than 10% of doctors in the RealSelf doctor community based on actual patient satisfaction, favorable feedback, and contributions to Q&A and other Realself activities. This achievement reflects Dr. Salemy’s commitment to providing exceptional care and results to his patients. For four years straight (2012 – 2015), Dr. Salemy has been a finalist on The King 5’s “Best Plastic Surgeons” list in their Best of Western Washington poll. Selected by local voters, this award is testament to his stellar reputation in the area. Dr. Salemy is a recipient of multiple awards from Vitals.com, which acknowledges physicians in various categories as rated by patients themselves, including excellence in care, compassion and making a difference in the lives of patients. Read more about Dr. Salemy’s awards from Vitals. Dr. Salemy has recently been recognized once again in this list in 2015. The prestigious list is compiled by the Consumers’ Research Council of America to find the best cosmetic surgeons in the country, and Dr Salemy is proud to have been frequently included since 2006. In 2014, Dr. Salemy was selected for the Reader’s Choice Award as Seattle’s best plastic surgeon by Seattle Magazine. He was also recognized by the same publication as “Best Cosmetic Surgeon” in 2011. To receive these awards says a lot about his reputation in the Seattle area as an excellent provider of cosmetic surgery. Dr. Salemy is proud to be recognized by patients who have rated him extremely highly on Vitals.com. He consistently won awards across multiple categories, and is also the recipient of the prestigious “5 year honoree” award. This award is only given to the top 1% of US physicians with a near-perfect score as rated by patients themselves. Dr. Salemy has been a recipient of this award since 2012. The Patients’ Choice award reflects that a physician has gone above and beyond the basics to make a real impact on the lives of their patients. Since 2008 the distinguished Dr. Salemy has been a consistent recipient of this award. The Compassionate Doctor Award is given by Vitals.com to doctors who have shown their patients the greatest kindness. Rated highly on his bedside manner, Dr. Salemy has been given this award every year between 2009 and 2017. Each year, the millions of visitors to Vitals.com vote for the very best doctors in their area. In 2014, Dr. Salemy received one of the highest awards possible, by being voted one of the top ten for the Seattle metro area, as well as the state level in Washington. To have one shows that the doctor has a stellar reputation among past and present patients, and continues to provide an excellent service. 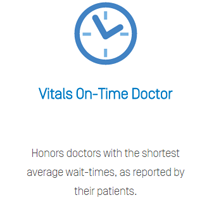 Dr. Salemy has been a recipient of Vitals On-Time Doctor award, which recognizes physicians who ensure patients have minimal waiting times. He has been honored with this award in 2009, and every year since 2014, demonstrating a longstanding commitment to giving his patients the best quality service.